Coming into this course I have spent four years studying the natural world, it’s processes, and humans’ impact on it. I consider myself an environmentalist and through this course I’ve learned how to become a better one. I wasn’t as much of a greenwashing skeptic before this class and I would always opt for the “green” option at the store even if it cost more. 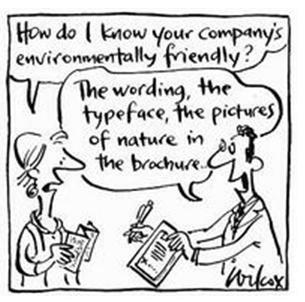 Now after learning all the techniques companies use to change the consumers’ perception of their merit I will do my research on organizations who claim the be “green”. Our biases and beliefs are decided by our personal perceptions of our surrounds and particularly how they are presented to us. The industries have locked into this and formed our perception to be altered. There are so many steps that have gone into the consumer mentality and even more steps to assure the cycle is continued. Thinking back about this class, I think about one of the first exercises we did in class where we formed small groups and described our own health history. Everyone had their own narrative which effected how the audience perceived that person’s health. The same thing is used with environmental advertisements. Certain facts are highlighted while others are omitted, giving a more positive image for the company. This leads me to the question I’ve been asking myself all semester, should that be legal? There are a lot of people who think there should me more mandates on greenwashing, pharmaceuticals, and in general environmental regulations. When actions done by companies could risk individual’s health, a community’s health, or our planet’s health why do we stay passive? I think as a whole, the demand for clear data and facts, both good and bad, should be required. In my opinion I think this would have to at least begin with regulating branding and introducing more third non-partisan groups to do research on the production and the product itself. Overall I think this class helped me become more aware of the effect imaging and branding can make and will help me make better decisions about my actions. This class has definitely made me more aware of the tactics that companies use in their imaging and branding as well. The “greenwashing” lecture helped me to see all of the things that companies will put on their products to try to get you to buy them so researching more into these things is something that I am starting to do. I think that all of the things we’ve learned in this class will be relevant for a lot of things that come up in our lives so I’m really glad that I ended up taking this class. When we were broken into groups the first couple of classes I was nervous because I really do not like “ice breakers” the first few class meetings, but then I understood the overall reason why. The health section was definitely my favorite. Those pictures are very applicable to this class. I also thought the exercises we did that first week were very interesting.